Prima flowers are awesome, of course, but one of my absolute favorite products that Prima makes are the clear stamps. The backgrounds, frames and images are all right up my alley - elegant, vintage and floral-y!! I used two sets on this card. The Pastiche paper was stamped with Songbird. I added a punched border and mounted it on kraft paper. Next, I adhered the Shabby Chic chipboard to the top of the card. I stamped a frame from the Insectae set and cut it out. 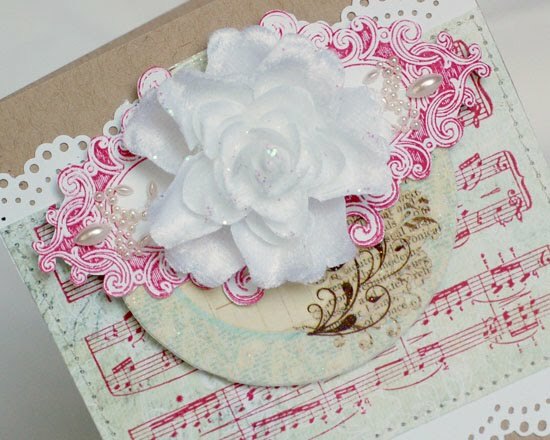 I adhered it to the chipboard and added the flowers and pearls. I like using stamps as accents on layouts, too. 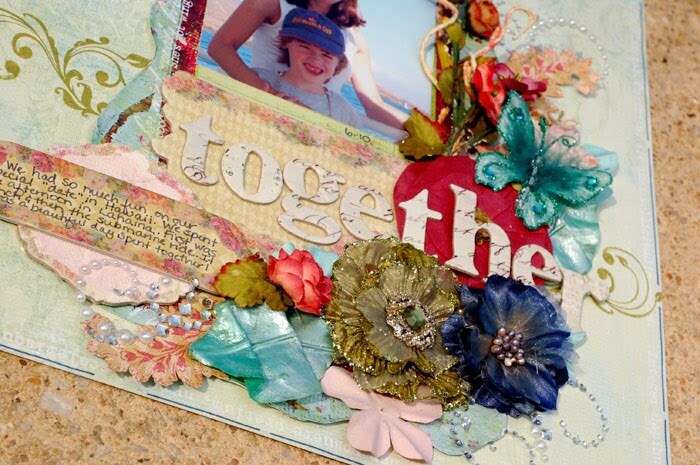 Here is how I used them on my Together page that I posted a little while back. I stamped directly on the paper using a stamp from the Clear Stamps: Nouveau set. Then, I stamped a leaf image from Clear Stamps Green Leaf and cut it out. I tucked it into the flower spray. So, that's it for today. If you haven't tried Prima's stamps, I highly reccomend them! I love my Prima flowers and the one stamp set I have! It's so intricate and lovely dressed up or down. Very pretty card that you made! Thanks for sharing how you did the stamping and making of it. What a gorgeous card! 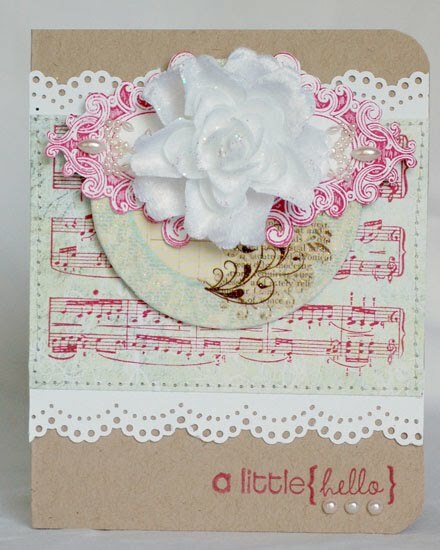 I love how you used the stamps on it and I like the white flower accent. Love the elegant way you've mixed those gorgeous stamp images into your crafty projects, Anabelle! You do such amazing work!